Feet Placement for Concentration - Where Are Your Feet? Has this ever happened to you? Your student is looking at you…. but it’s like “no one is home”? but they are just “not there”. Next time this happens…look at their feet placement for concentration. Yes, their feet. Feet Placement for Concentration? Really? Do they have their feet tucked under them? Are they swinging their legs to an imaginary marching band? Do they have their feet or legs crossed? If so, then they don’t have their “thinking feet” on. Yes, I totally understand that no one is ever going to Google "feet" and "thinking" and "theory" in the search bar...but this little tip has worked for me every single teaching day. It really does make a difference (and I teach a lot of Special Needs Students). 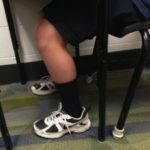 Feet Placement for Concentration - What are Thinking Feet? For proper feet placement for concentration, you must use "Thinking Feet". Thinking Feet are feet that are flat on the floor. Studies in Sensory Processing have shown that your body and your brain focus and process information better, stronger and faster when your feet are flat on the floor. I tell my students that they must have their thinking feet on! 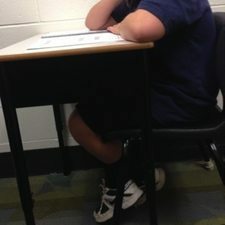 Feet Placement for Concentration - It Really Does Work! Whether they are sitting at the piano or at the table doing theory, ensuring that your student can put their feet flat on the floor (or on a small stool or bench) will enable them to think better, stronger and faster! Next time you find yourself being distracted by the world around you instead of focusing on the task at hand…look at your feet. Do you have correct feet placement for concentration? Are they flat on the floor? It does make a difference. At Ultimate Music Theory, we love to share in the excitement of our Teachers. 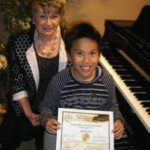 I am pleased to attach a photo of my student James Wu after presenting him with his Certificate & Gold Pin for achieving 100% in the Basic Rudiments Exam, held in Richmond, B.C. James just had his 9th birthday a few weeks before the exam. He really has enjoyed working through your Basic book and is very motivated with the tests at the end of each lesson. James has now almost finished the Intermediate level - he is so keen that he even took your book to Taiwan on his vacation during the summer holidays, and completed 5 chapters on his own! As a Teacher, I am so inspired with the layout and clarity of your books and for me it is a real joy to teach from the "Ultimate Music Theory" books and to see the accomplishments my students receive! Thank-you for all your encouragement to Teachers and Students everywhere! Sincerely, Grace Hoff - A.L.C.M., A.R.C.T., R.M.T. Kelly Kirby Instructor. P.S. I would be interested in knowing the age of the youngest student to take this exam and receive the 100%? At “just turned 9”, I think that James just might be the youngest 100% Club Member for Basic Rudiments! Congratulations! When your student receives 100% on their nationally recognized theory examination (like the Royal Conservatory of Music or Conservatory Canada), you can register them for the 100% Club! Free Theory Worksheets - yes, we have done the work for you! Music Theory Exam and Answers - we are the only place where you will find the answers to make marking easy for you! Music Theory Certificates of Achievements - to print and present to your students when they finish their Ultimate Music Theory Workbooks. Errata Pages - alas, yes - we did miss some boo-boos before the books went to print. You can download the errata pages here in order to mark the corrections in your answer books! Music Theory One Hundred Percent Club - Here it is! When you click on the Music Theory One Hundred Percent Club link, fill in the form at the bottom to register your student for the 100% Club. I will email you a Certificate to present to your student. Remember to visit and “like” the Ultimate Music Theory Facebook Page too. You can check out our 100% Club Album (with just a few of the dozens of 100% Club Members in it). And now...look at your feet! Do you have proper feet placement for concentration? Are they helping you think?